For the concrete pavement, a portable concrete batch plant (Rexcon Logo 12 central mix plant) was erected on site to produce all the concrete for the roadway. Crews rebuilding the original, 30-year-old concrete roadbed on a more than 2 mi. (3 km) segment of Interstate 65 in Jefferson County, Ala., have finalized the project, which replaces an aging, maintenance intensive segment of I-65 from I-459 to U.S. 31. Work was completed in January 2012 at a total cost of $21,300,920. The high-profile assignment involved several ALDOT, contractor and city personnel, and was part of the ALDOT’s Progress on Alabama Roadways campaign to preserve critical highway infrastructure. ALDOT dubbed the project Progress65, and said the new concrete surface will provide an easier ride along one of the states most traveled interstate corridors. McCarthy Improvement self performed the existing concrete roadway removal, all the earthwork, all the drainage/storm sewer work and placed the new concrete pavement that serves as the final riding surface. The existing roadway was removed in stages to allow traffic to still travel through the work zone. Once the existing pavement was removed, approximately 12 in. (30.5 cm) of dirt was removed to get to subgrade elevation. Six in. (15 cm) of asphalt was placed as base for the new 14-in. (35.5 cm) concrete layer which is the final riding surface. Once the concrete pavement was completed in phases, traffic was moved onto the new concrete pavement, which allowed the old pavement to be removed and replaced. This cycle repeated until all the old pavement was replaced with new material. According to Wolf, “It means a high-strength, smooth riding concrete section of roadway that will be worry-free for years to come. Overall, the project went well, despite its many phases. “The main challenges were the traffic and logistics. The biggest issues, honestly, were issues with change. Concrete roadways, while prevalent in Alabama, have not been constructed in the state in decades. Throughout much of the project three lanes were open in the northbound and southbound directions. To accomplish this at different times throughout the project one lane of traffic traveled in a backwards direction on the opposing travel lanes. Most of the work was performed behind temporary concrete barrier walls to protect the traveling public and the workforce. There were reportedly four separate occasions when either an “on” or “off” ramp was totally closed to traffic to allow for it to be reconstructed. 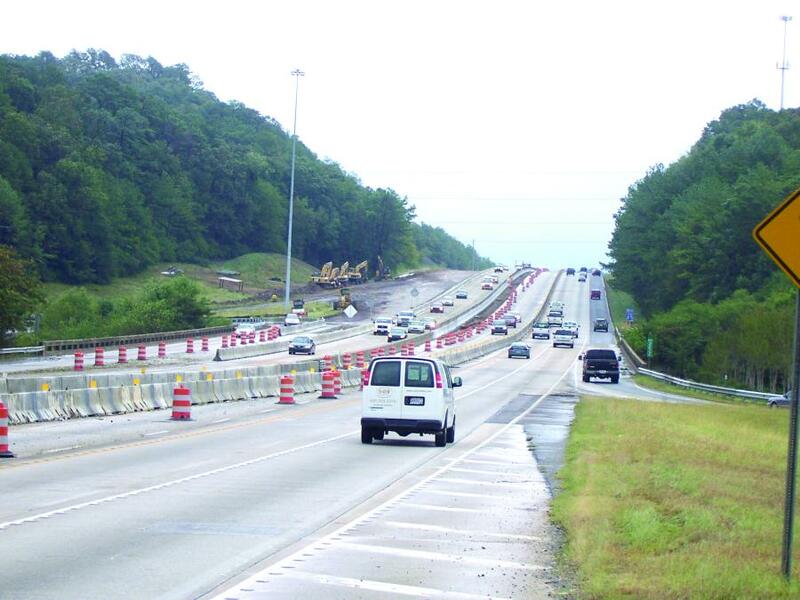 Traffic was detoured on I-459 and US 31 for up to two weeks to allow this work to take place. As part of the concrete pavement removal and replacement, McCarthy used a series of four Caterpillar excavators, one to rake the concrete off the reinforcing steel, another equipped with a hydraulic shear to cut the steel, one to load the steel and the last to load out the concrete. Dozers, motorgraders, rollers and a trimmer were used to make subgrade, while an excavator, loader and roller were utilized for drainage storm sewer work. For the concrete pavement, a portable concrete batch plant (Rexcon Logo 12 central mix plant) was erected on site to produce all the concrete for the roadway, a Guntert and Zimmerman S850 concrete paver ranging in width from 12 to 32 ft. (3.6 to 9.7 m) was used for the mainline and ramp concrete pavement. A GOMACO 2600 placer/spreader along with a GOMACO TC600 cure/tine machine rounded out the paving train. On smaller placements, a GOMACO 2800 concrete paver and a GOMACO RTP 500 placer also were utilized. Materials included 75,000 cu. yds. (57,341 cu m) of concrete, 65,000 tons (58,967 t) of asphalt, 750,000 lbs. (340,194 kg) of reinforcing steel, seven new overhead sign structures, 10,000 linear ft. (3,048 m) of permanent concrete barrier wall and 7,000 linear ft. (2,133 m) of RCP storm sewer. Tight working conditions in a very busy section of interstate forced most of the work to occur after hours. Night work required more planning, a larger staff and a heightened safety presence to ensure worker and public safety. Wolf said the job required extensive homework. Early phases of work on the project — one of the few concrete pavement jobs in Alabama in recent years — resulted in outside shoulder upgrades on I-65 northbound and southbound, and required the outside lane in both directions to be closed and blocked off by temporary concrete barrier walls to provide a safe work zone. The single outside lane closures and installation of temporary barrier wall began in late March. Once the shoulders were upgraded, traffic was shifted while rebuilding began first on the northbound lanes, then the southbound lanes. ALDOT and its contractor reportedly made every effort to minimize traffic impacts, but the rebuilding resulted in lane closures and traffic shifts throughout the duration of the project. It also required the use of alternate routes while exit ramps were closed. Ramp closures were carried out one at a time, ranging from a maximum of eight to 14 days each. Regarding ramp closures, the initial phases of work identified a progression and sequence that allowed ALDOT to announce each ramp closure in advance. Efforts were made to minimize traffic impacts and avoid conflicts with holiday travel and major sporting events. With Alabama’s interstate system between 30 and 55 years old, major rebuilding projects are essential to preserve interstates for decades to come. Usually, these projects require temporary reductions in the number of lanes, lane closures and short duration ramp closures. The goal for completion was the end of December — an ambitious timeline —requiring much of the work to be performed seven days a week, and, at times, around the clock. Work officially wrapped up the following month. Motorists had been warned of longer travel times, heavier congestion and some detours when ramp closures were necessary. The goal was to be off the clock by the end of 2011, because officials didn’t want to impact commuters and travelers any more than necessary. alternate routes, to adjust arrival/departure times, to observe work-zone speed limits and work-zone signs, and use extreme caution in this area while construction was under way. The work included rebuilding the ramps on I-459 and U.S. 31, but not redesigning them. The ramps were closed during the work, and detours were set along U.S. 31. The ramps were not scheduled to be widened during the rebuilding, but their lanes were re-striped. That means the exit ramp from I-65 southbound to U.S. 31 – where an extra lane was tightly placed onto the ramp’s shoulder years ago — required drivers headed for U.S. 31 south to negotiate the curving ramp only inches from the guardrail. ALDOT officials say the concrete work was done as a safety issue, but it does not preclude adding lanes to the ramp at a later date. New lights for the interstate also were a part of the contract. Subcontractors involved in the high-profile project included Dunn Construction, Ozark Safety Services, H&L Construction, Ozark Striping Company, Forestry Environmental, Antigo Construction and Lane Hauling and Excavating and Abramson LLC. A Miller 8800 slipform machine was needed for placement of the permanent barrier. Approximately 4,500 cu. yds. (3,440 cu m) of ALDOT AF1C concrete was used. Debra Young, owner and president of Lane Hauling and Excavating, said her team hauled dirt and demo materials in preparation for the new road. Lane Hauling and Excavating provided dump truck transportation for 20,000 unit hours of material hauling and 90,000 unit tons of rock transportation which amounted to roughly $2,000,000 of transportation services. State officials say they had earlier tried to repair the concrete on I-65, but those efforts failed. The work involved removing the 52-ft. (15.8 m) long sections of concrete, which are 8 in. (20 cm) thick and reinforced with steel, and replacing them with shorter sections of plain concrete that will be 14 in. (35.5 cm) thick, according to Davis. A&B Dirt Movers Expands Interstate 40 in Central Ark.